I am a new follower of your blog via the hop. Feel free to drop by blog any time. Hi! I found you via the sundae hop! Love your etsy shop! Following you from the Saturday Blog Hop! I am new to couponing and I love your savings posts! I'm a new follower from Say Hi Sunday…I hope your weekend is full of joy. Following from Swingin’By on Sunday. Hi! Following from the Hop now! Hello! 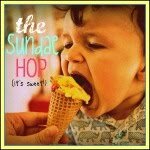 I am following you from the Sundae Hop! Your blog is so cute and I'm looking forward to reading more! Hi there! We are your newest followers!